Each year the United Nations’ International Day of Peace (IDP) officially takes place on September 21. 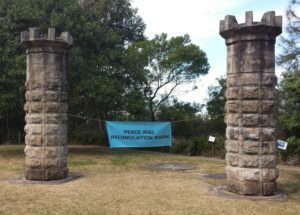 To mark the occasion locally, members of MPG participated in a ceremony held in the Marrickville Peace Park (Richardson’s Lookout) on Saturday, September 16. The event was organised by our sister group the Gallipoli Centenary Peace Campaign (GCPC). A full account, including the speeches, can be read here. Photos of the event can be viewed here. 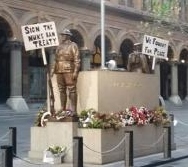 Early in the morning on the actual day – Thursday, September 21 – at the Cenotaph in Martin Place, placards with peace slogans were found to be placed on the bayonets of the bronze servicemen standing guard. Photos of these placards can be viewed here.